I'm always astonished when people in authority act without thinking. Perhaps I'm naive. What with Donald Trump blabbering all over about everything, it's pretty much par for the course in America these days. I shouldn't be surprised, really, because I've seen these things over and over. The other day I blogged about a topic that NYSUT leadership found sensitive. I know this because they tweeted a response that was baseless and absurd. I can only suppose you don't go the baseless and absurd route if you've got a better one. Let's take a look at that. First, there's the accusation of bias. Bias is generally associated with prejudice. The blog they criticize was not created out of whole cloth. I'm certainly opinionated, this blog reflects my opinions, but my opinions are formed by years of experience, reading and observation. Bias is when you look at something you don't like, fail to consider it, and then condemn it for a predetermined reason, which is likely tantamount to no reason at all. Someone's biased here, but it isn't me. Let's take, for example, the assertion that the blog was "fact free." I count four sources for that blog. There was the Times Union article suggesting that NYSUT leadership wanted to cut benefits for its employees, who specifically referenced pensions. There was a Politico piece specifically referencing a law that allows NYSUT leaders to accrue double pensions. There were quotes from PJSTA President Beth Dimino suggesting NYSUT tried to bypass local presidents to solicit VOTE COPE contributions, and there was a quote from former NY Deputy State Comptroller Harris Lirtzman, who'd done some homework analyzing the NYSUT pension system. So that's what I based my opinions on. 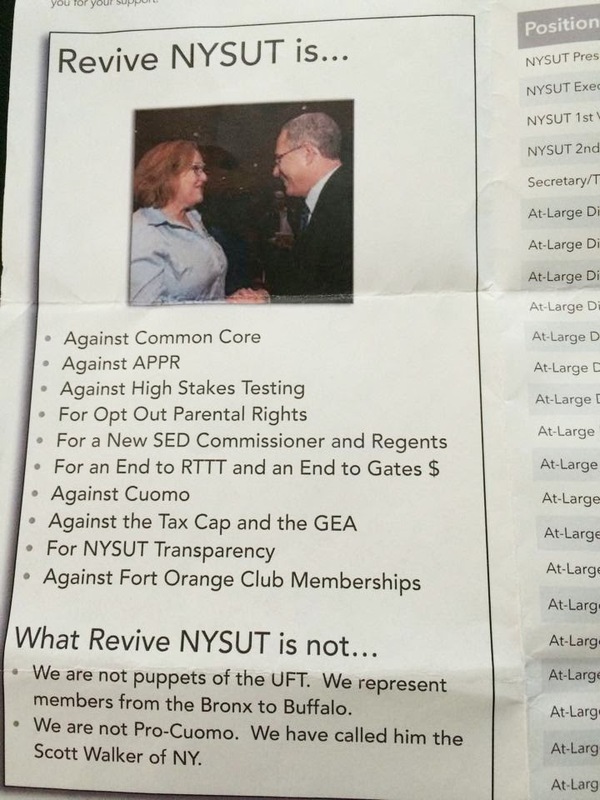 What did NYSUT Unity base their opinions on? Absolutely nothing but their own prejudices, as far as I can tell. Now the upstanding individual who likely writes this stuff did a hit piece on me a while back, calling me a part-time teacher. (I'm not linking to it because it doesn't permit comments and no one reads the blog anyway.) I don't remember exactly what I wrote to cause him to do this, but he wrote a long piece about what he decided I thought. That's easier than actually confronting what I may have said or done, and that's what you call a strawman fallacy. It doesn't get into the difficult business of addressing whatever the argument was I'd made. Rather, it invents an easy target, something that it claims I think or believe and simply attacks that easier target. These are the sorts of things you do and say when you have no argument. And as Revive NYSUT broke promise after promise, I know I've done the right thing by exposing and opposing them. They were against Common Core, they said in the pamphlet above, but President Karen Magee, at an AFT Convention, suggested the alternative to it was a "free-for-all." They said they were against APPR but haven't moved a millimeter toward its repeal. They said they were against Cuomo but failed to oppose him in two primaries and a general election. They say they're for NYSUT transparency, but when you mention their verifiable actions they accuse you of being a lunatic. All of this is troubling. What's most troubling, though, is these are the people who are negotiating for us at a state level. It's no wonder Cuomo walks all over us, and at the very nadir of his popularity is able to make APPR even more draconian, with the aid of his Heavy Hearts Assembly. Can you imagine people who think the genius who wrote that tweet should be representing us? Can you imagine people with that brand of judgment negotiating for us on a state level? I can. And sadly, it explains a lot.